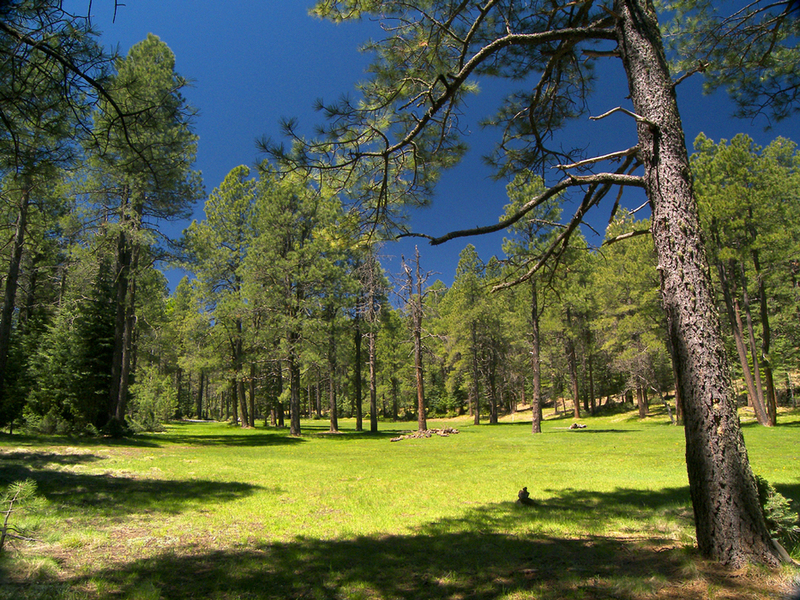 Overview: The Barbershop Trail #91 is part of the Coconino National Forest's Cabin Loop Trail system on Arizona's Mogollon Rim. Once part of a network of trails used by early ranchers and the Forest Service, the route of the historic Barbershop Trail was marked by blazes (notches) cut into the bark of trees. This description will cover the Barbershop Trail from its west end to its eastern terminus at Buck Springs Cabins. Following the route of this trail is quite challenging. One must keep a constant eye out for trail junctions, as well as blazes, which consist of two notches deeply cut into the bark of a tree, one on top of the other. Some areas are marked by cairns and small signs indicating "Cabin Loop Trail". A well trodden footpath is a rare sight on this hike. 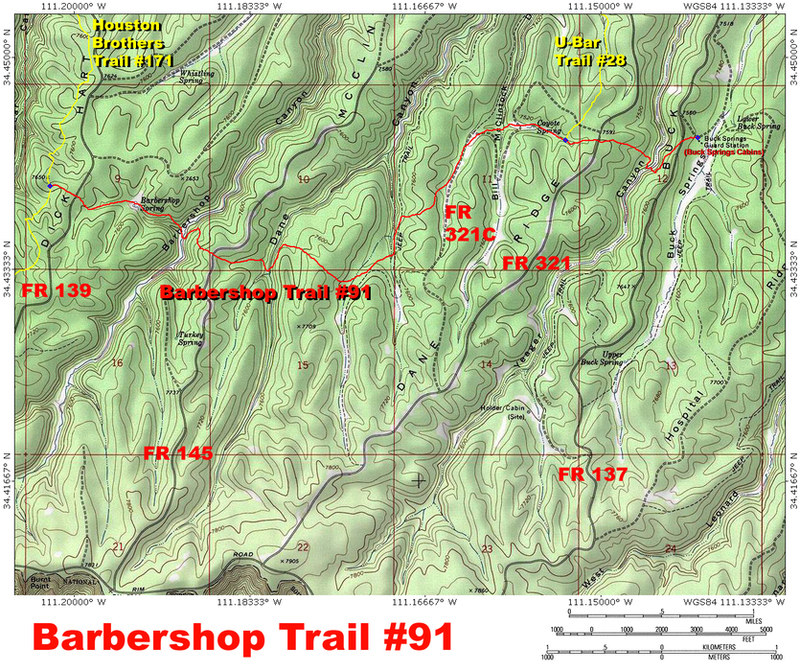 I highly recommend downloading and using gpsjoe's excellent and highly accurate Barbershop Trail gps routes. Or, at the very least, bring a copy of this topo map. Many of the roads that access this trail are closed during the winter, due to snow. If you are in doubt, check with the Forest Service for road conditions before you go. 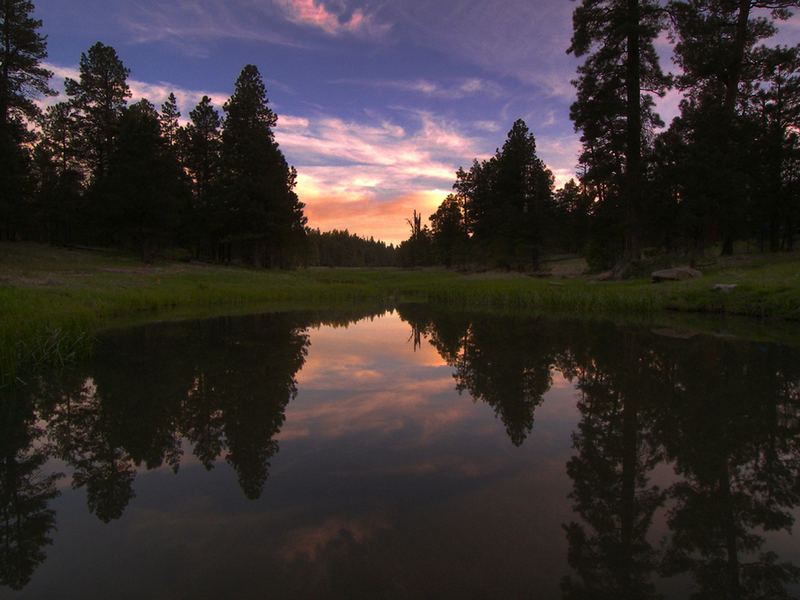 Camping: There are many outstanding campsites along the Barbershop Trail. Water may be available at Buck Springs, Barbershop Canyon, Dane Canyon, and Bill McClintock Draw, but check with the Forest Service for water conditions before planning a trip to the area. History: The Barbershop Trail derives its name from a local sheepherder who had a talent for shearing sheep, as well as cutting the hair of his fellow herders. 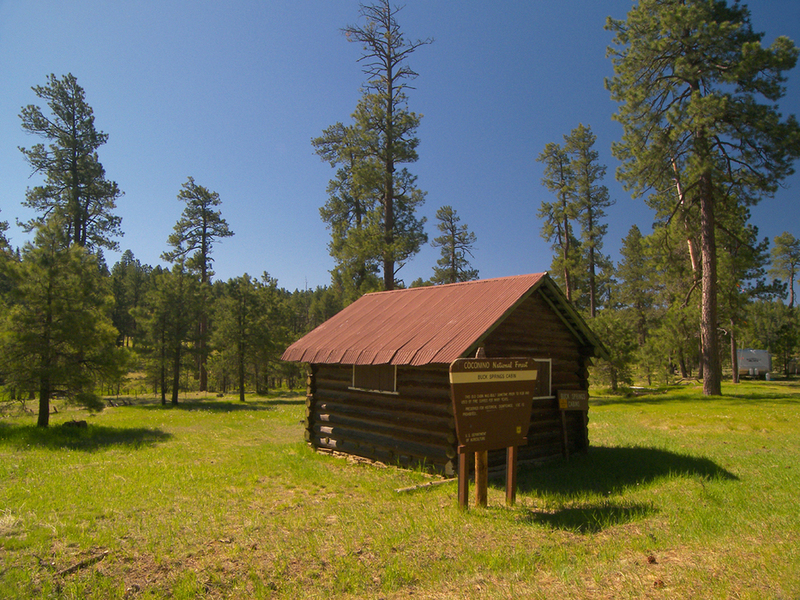 Buck Springs Cabins, where this trail comes to an end, originally consisted of three cabins, built by the Forest Service as housing for fire crews. The first cabin was built around 1904, the second in 1923, and the last in 1946. Only the two newer cabins, which have been preserved for their historic value, remain. Hike: From the junction with the Houston Brothers Trail #171 at its west end (mile 0.0 for this description), head east along the Barbershop Trail to where it crosses Forest Road 139, at 0.15 miles. At this signed crossing, follow the Barbershop Trail east, as it gently descends a lush draw. 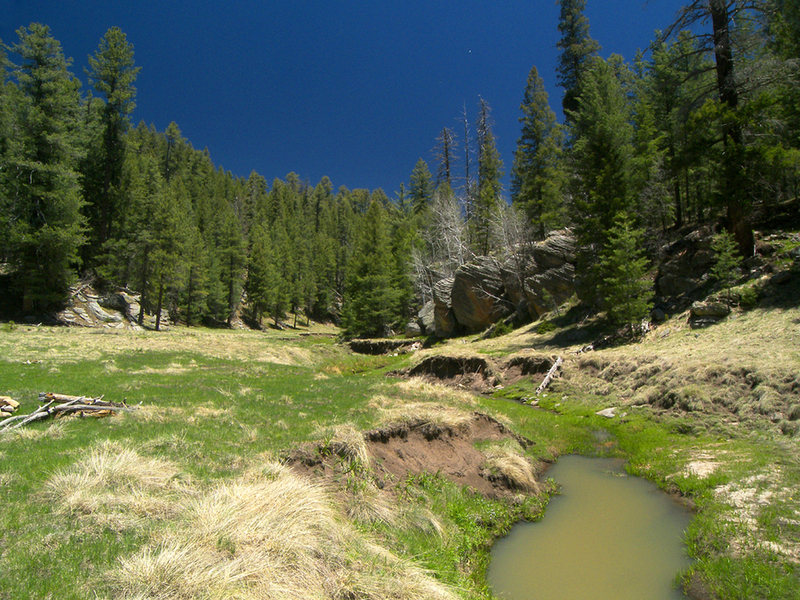 The draw soon opens up into a large meadow, where four side drainages come together, near Barbershop Spring. Although the trail disappears while crossing the meadow, it reappears on the north slope of the canyon, and continues its descent to the east. Watch for cairns and blazes. A quick drop through the Coconino sandstone deposits the Barbershop Trail at the bottom of Barbershop Canyon. Barbershop Canyon is a tempting place to linger, with its grassy bottom, aspens, and cross-bedded sandstone bluffs. The trail leaves the canyon along a well constructed path that ascends the eastern wall. Now free from Barbershop Canyon, the trail crosses Forest Road 145 at the top of a ridge. Beyond this signed road crossing, the trail descends among bigtooth maples to the narrow bottom of Dane Canyon, before turning north to climb the opposite canyon wall. The trail briefly follows an old logging road along the east rim of Dane Canyon, then turns east to climb a low ridge. The route is not obvious on top of the ridge, so look carefully for blazes. Heading southeast from the ridge top, the trail soon turns northeast to cross a picture perfect, park like meadow, where the path disappears briefly. At the far end of this meadow, the trail darts through the trees for a few hundred feet along side an unmarked jeep trail, before turning north to pass through a smaller meadow. The Barbershop Trail then descends to cross a densely forested side branch of Dane Canyon, before turning north to follow another old jeep trail. After 0.2 miles on this jeep trail, the Barbershop Trail makes a hard right to scale yet another ridge. The trail then turns north at the top of the ridge and descends to meet Forest Road 321C. The Barbershop Trail shares its route with Forest Road 321C while traveling past a long meadow. Just before Forest Road 321C bends east, at about 3.2 miles, the Barbershop Trail veers to the right to cross both the long meadow and Forest Road 321C. The Barbershop Trail leaves the road behind, turns east, and makes a quick descent through thick stands of fir to reach the bottom of Bill McClintock Draw. The trail briefly jogs north to follow the draw, before turning east to make a final crossing of Forest Road 321C. The Barbershop Trail continues east up a shallow side canyon and soon enters a beautiful grassy glade, bordered by tall firs, where it passes a sign for Coyote Spring. The Barbershop Trail reaches a signed junction with the U-Bar Trail #28 at about 3.9 miles, among tall aspens and bigtooth maples. The Barbershop Trail continues east up the draw, and makes a signed crossing of Forest Road 321 within a quarter of a mile. After the crossing, the Barbershop Trail descends to the east, and crosses three ancient logging roads before reaching the rim of Yeager Canyon. The trail bends right, becomes more defined, then drops down to cross picturesque Yeager Creek. Across the creek, the trail peters out somewhat while climbing a rather steep and eroded slope. At the top of the slope, the Barbershop Trail turns left onto another old logging road, which it follows for 0.1 miles, before making a sudden right to climb another steep and heavily wooded slope. This particularly lush stretch comes to an end on top of a ridge, where the Barbershop Trail crosses Forest Road 137. The primitive, blazed route of the Barbershop Trail now steadily descends to the edge of a broad, grassy meadow in Buck Springs Canyon, where it comes to an end at about the 4.9 mile point. The historic Buck Springs Cabins stand near the end of the trail. The waters of Buck Springs are impounded by a concrete dam, a short distance downstream from the cabins. West Access on Forest Road 139: From the highway 87/highway 260 junction in Payson, travel north on highway 87 for approximately 28 miles, then turn right (south) onto the Rim Road (Forest Road 300). Follow the Rim Road #300 for approximately 16.4 miles, then turn left (north) onto Forest Road 139. Follow Forest Road 139 for about 1.9 miles to the Barbershop Trail sign along the road. Forest Road 139 crosses the Barbershop Trail about 0.15 miles east of the Barbershop Trail's west end. East Access at Buck Springs Trailhead: From the highway 87/highway 260 junction in Payson, travel north on highway 87 for approximately 28 miles, then turn right (south) onto the Rim Road (Forest Road 300). Follow the Rim Road #300 for approximately 20.3 miles, then turn left (north) onto Forest Road 137. Follow Forest Road 137 for about 3.75 miles, then turn right onto a short spur road that leads to Buck Springs Trailhead.